Artwork to celebrate the Paralympic Games has been unveiled to mark 100 days to go until the opening ceremony. The art, inspired by the winner’s podium and the Surrey countryside, was created by 46-year-old Guildford artist, Jane Corpes, who attends a Surrey County Council day centre. 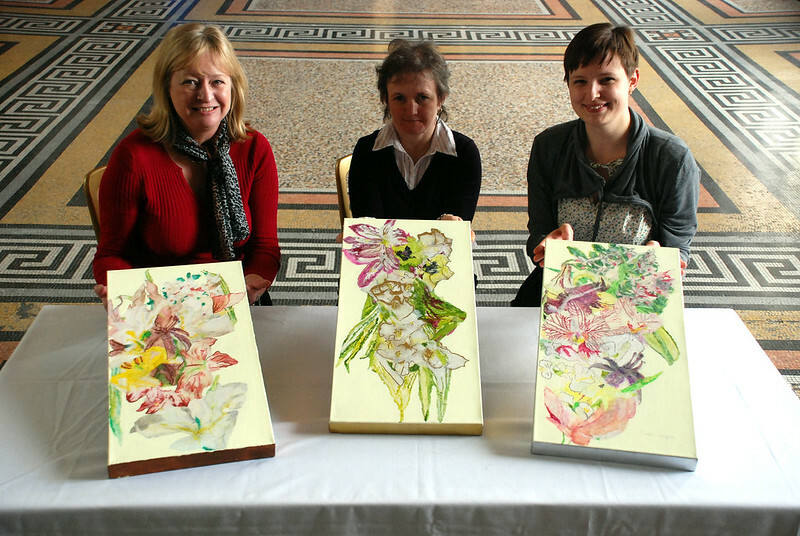 Surrey County Council Cabinet Member Helyn Clack, artist Jane Corpes and tutor Holly St John (L-R) holding Jane’s paralympic inspired art work. Click here to download. The art will be on show at the Olympic torch relay celebrations at Stoke Park in Guildford on 20 July. The 100 day to go countdown was also marked by the P&G Surrey Para Games which took place today (21 May) at the Xcel Leisure Complex in Elmbridge. Organised by Surrey County Council and Active Surrey, it saw 80 children aged seven to nine from four special schools take part in sports such as cricket, sitting volleyball, para canoeing and wheelchair basketball. The artwork was commissioned by Surrey County Council to celebrate the Paralympic Games coming to the UK.